Welcome to the Dwel @ Hepburn studio. Facing the inner courtyard, daily views of the lush, flowering grounds will be a treat. Commanding attention in this living space is the stunning piece by Martin J. Cervantez. A textured rug, arc floor lamps and sunburst mirror, just some ways to add spice and whimsy to a living room. Enjoy some me time and watch the 48 inch Smart TV. Stepping into the bathroom, you will not believe how spacious it is. Contrasting white and dark cupboards look playful and sleek, while offering convenient hiding space for all your toiletries. Close the bedroom with sliding pocket doors. Rivaling the bed for attention is the one-of-a-kind painting above, by Martin J. Cervantez. High ceilings and sweeping lines elongate the apartment, giving an air versed tranquility. Sleek Bosch appliances, including the microwave drawer, are the next word in kitchen trends. Dwel's 'standard' of functional yet luxuriously tailored apartments were designed in concert with the property to ensure an unrivaled guest experience and a level of service that is uniquely personal. 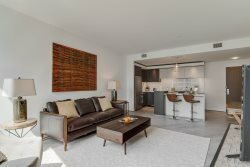 The two masterpieces by locally renowned artist and veteran, Martin J. Cervantez, featured prominently in this studio apartment, were the inspiration behind the design process, a study in texture and urban calm.